Increasing lean body weight, body mass, and physical endurance in certain patients with HIV infection. It is usually used along with other medicines that treat HIV infection. It may also be used for other conditions as determined by your doctor. 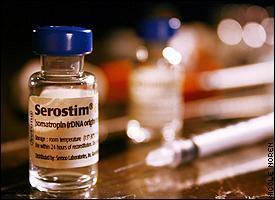 Serostim is a growth hormone that produces effects that are identical to the body's naturally occurring growth hormone. It affects the growth of bones, muscles, internal organs, and other tissues of the body. Serostim® [somatropin (rDNA origin) for injection] is a human growth hormone and the only therapy for HIV-wasting FDA-approved to increase weight and lean body mass (LBM), and improve physical endurance. It is indicated for the treatment of HIV wasting in patients receiving antiretroviral therapy. Serostim® helps build and maintain weight and lean body mass. It also helps support metabolism, using fat for energy instead of lean body mass. Studies have shown that patients with HIV wasting who were given Serostim® for 12 weeks significantly increased their weight and lean body mass, improved physical endurance, and reported improvements in their perceptions of their HIV-associated wasting symptoms. Bodily pain increased and was attributed to musculoskeletal discomfort and increased tissue turgor observed in approximately 1/3 of patients treated with Serostim®. These side effects are usually manageable with non-prescription pain medicine. Talk to your doctor to see if Serostim® is right for you. Serostim is a drug that mimics human growth hormone, a chemical produced by the body to help maintain and build bone, muscle, and organ tissue. 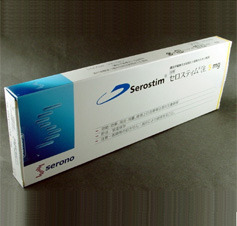 Serostim is marketed by Serono Laboratories. The drug has been approved by the U.S. Food and Drug Administration (FDA) for the treatment of AIDS-related wasting syndrome and weight loss. It is also being studied in clinical trials for the treatment of lipodystrophy, a side effect of anti-HIV drug therapy. It may also work as an immune-based therapy by helping the thymus gland to produce new T-cells. Serostim can be used to treat wasting syndrome, an AIDS-related illness defined as a loss of more than 10% of body weight, along with more than 30 days of either diarrhea or weakness and fever. Left untreated, wasting syndrome is associated disease progression and death. In people with wasting syndrome, both fat and muscle are lost. While losing fat is not harmful to the body, losing too much muscle can be a very serious problem. Serostim works by protecting muscle in the body and helps form new muscle.